Winner's will be notified by email and must respond within three days or another winner will be selected. Winners will be notified by email and have 72 hours to respond. Failed to respond to email notification within specified time frame resulting in a new winner being drawn. All you need is a few scraps from your craft projects to create this beautiful and useful gift item. 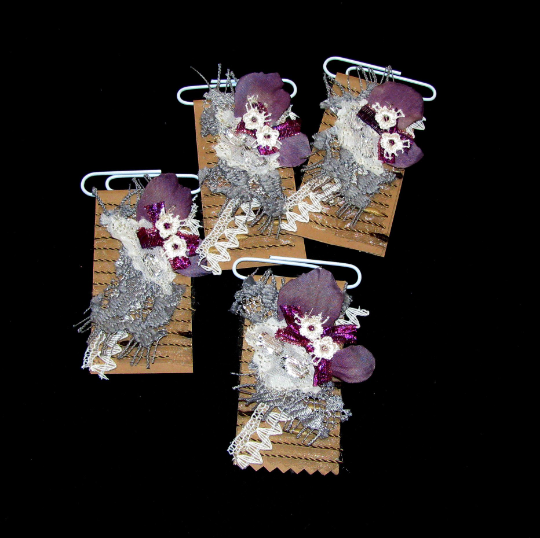 They make great party favors, gift bag stuffers, or add it to your custom gift wrapping. trim, fabric, floral petals, beads, etc. Then just let your imagination take over. 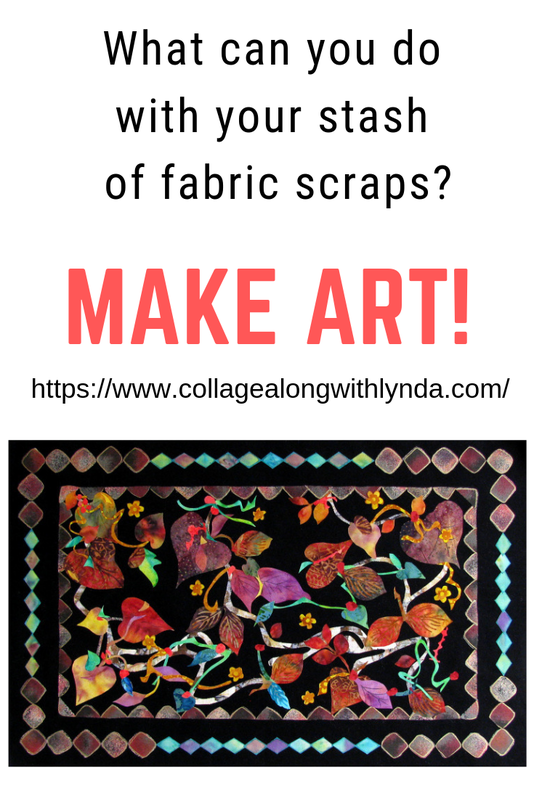 One thing is certain in life, If you sew or craft -- You have SCRAPS! What isn't as certain is finding ideas to make fun and useful items from that scrap pile. So this series will offer you some visual inspiration. Front View: Made from fabric scraps. Inside lining is quilted cotton. Velcro closure on pouch with a snippet of braid trim. Pouch measures 6" x 6". Back View: Fabric scraps with satin ribbon trim across top. Key pouch and eyeglass case - great small gift ideas. 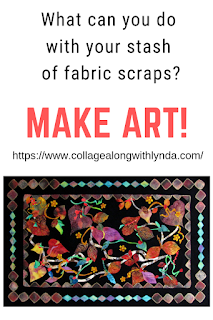 When I'm finished with a sewing, quilting, or fabric art project, I always take the time to add fusible web to the back of any leftover scraps that might otherwise be thrown away. I then tuck them away in a drawer until I'm ready to use them. How can they be used, you ask? I use them in fabric art pieces, fabric mosaics, fabric collage quilts, etc. Color of Autumn is one such piece. 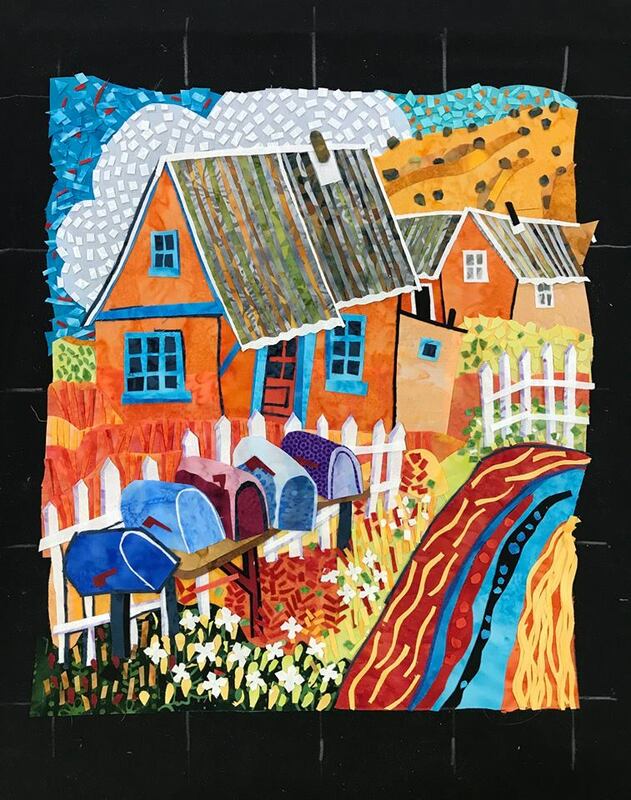 I'm so delighted by the beautiful fabric art created by the participants in my recently completed ''Five Mailboxes' workshop. I will be showcasing a few of those works, so check back and don't forget to comment. 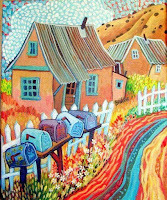 The workshop participants all used the same inspiration image, a painting by Artist Sally Bartos. 1. What have you learned? 2. Do you have a better grasp of your artistic style? A little bit. I think I would benefit from a discussion of what artistic style is. Right now I see my style as seeing the details and using fabric to recreate the details! 3. Is it getting easier to see detail? It's getting much easier to see the detail! I do worry that I’m seeing to much detail! But with that being said, I really love seeing the picture come together! I spent a lot of hours working on this piece. Time went by so fast! 4. Things you really like about your work. 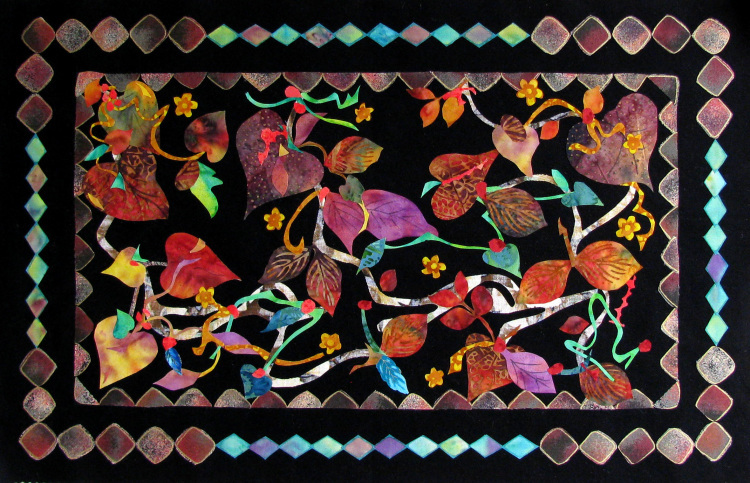 I really love the colors and the texture of the piece. I also enjoy the perspective I can see in my version of the painting. The movement of the fence and the sky are my favorite parts! 5. Things you’d change if you were to make this same project again, and why. These are not necessarily things that are wrong, they might just be things you’d like better if you’d done them a little differently. I would like to change the hills in the back. Maybe use more colors in it. I would like to see more of the rolling hills effect. I would also change the gardens. I do have texture in them. Maybe the texture looks too angular. Thank you, Kitty, for sharing your thoughts with us. 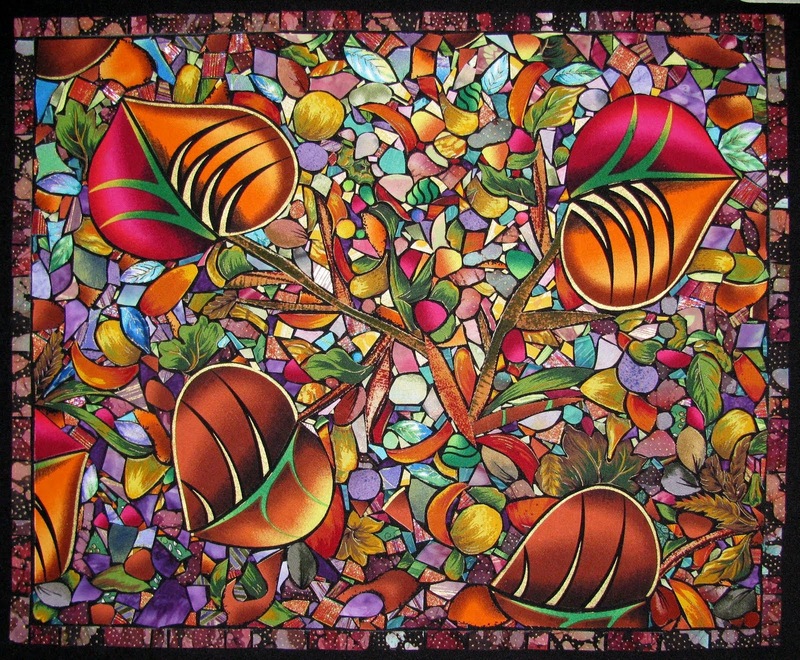 I'm looking forward to working with you in the Mosaic Extravaganza workshop starting January 3rd. focal point captures a viewer's interest and brings them into your artwork. A focal point helps give perspective, sets borders, defines size, and often sets the mood of your work. The general rule when positioning the focal point is that it should be off-center (both horizontally and vertically). To understand why, it helps to know the difference in balance and symmetry. Symmetry – regularity, geometrically centered. For whatever reason, we humans tend to find symmetry boring in art, fashion, color range, interior design, etc. A centered focal point doesn't engender interest. Why? When our vision is directed first to the center of a piece of art, our brains tend to say – that's everything – and we don't look further. But when the focal point is off center, it implies that there is more in this image that we haven't seen yet and we let our eye roam. Balance – equal distribution. For an artist, balance is the distribution of the visual weight of objects, colors, texture, and space that give us a sense of stability and harmony. We like balance and strive to achieve it by composition and positioning. 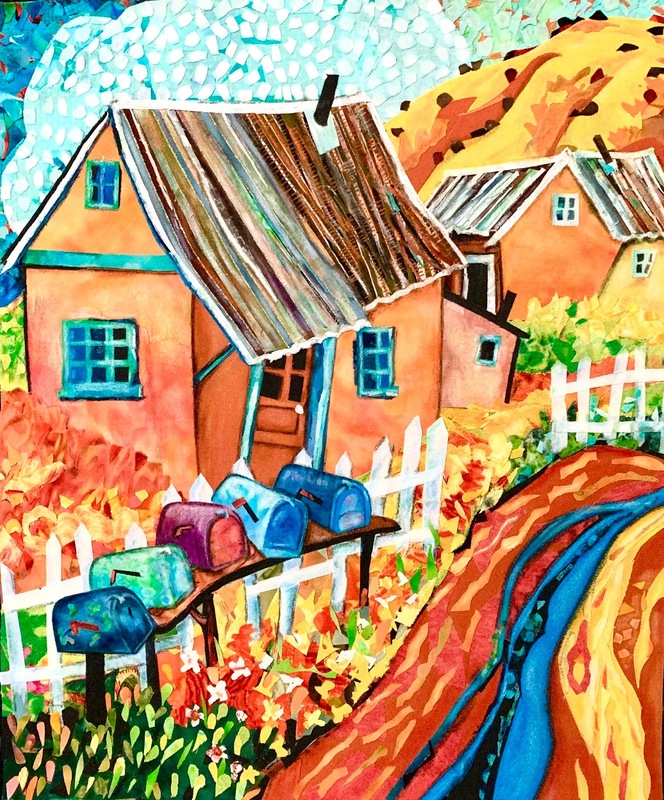 Artists Sally Bartos' Original Painting. Example: How did the artist, Sally Bartos, achieve balance in the 'Five Mailboxes' painting? If we consider the weight and position of the painting's focal point alone, the five mailboxes, they would tend to tip the scene forward. But when viewed with the balancing elements of the houses and hill, everything settles equally in place. As humans we tend to love balance because of the emotional result it gives us – harmony. On the other hand, too much symmetry frustrates us emotionally. Most of us don't even realize why we feel uneasy about a room that is too symmetrically furnished. Think about a dinner table set with perfectly arranged dinnerware. Every plate, fork, knife, napkin, and glass are in arranged symmetry. It should be finished at this point. But what do we do next? We balance all that symmetry with a centerpiece that gives us emotional harmony. A lot of the technical aspects of composition are done for us when we're working from a guide image. In my fabric art workshops, you notice that I use no patterns. However, I do utilize a grid, why? The grid automatically places the balancing elements in their respective positions for us. We don't have to decide how high or low to place the horizon or where to place the focal point to achieve interest and balance. the artist or photographer has done that work for us. 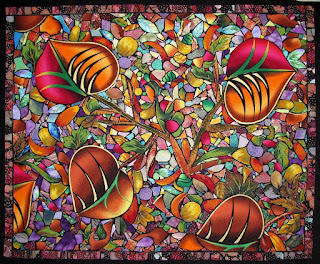 Art and fabric go together as yummy as butter on toast. 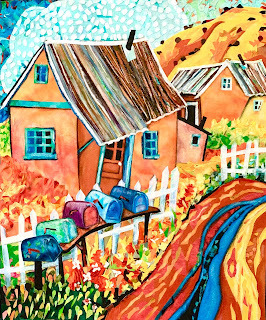 Why not join one of my workshops and learn to use this wonderful medium to create artwork uniquely your own, or, simply purchase the video illustrated tutorial and create at your leisure. For me, like most other artisans, creation begins with inspiration. Sometimes that inspiration comes with an idea I dream up in my head. At other times, inspiration comes from what I see in art, photography, scenic vistas, architecture, nature, and textural items. You can see some examples of work I've created in my Gallery. Lately, with my focus on teaching my fabric art workshops, I've focused on paintings and photographic images for inspiration. 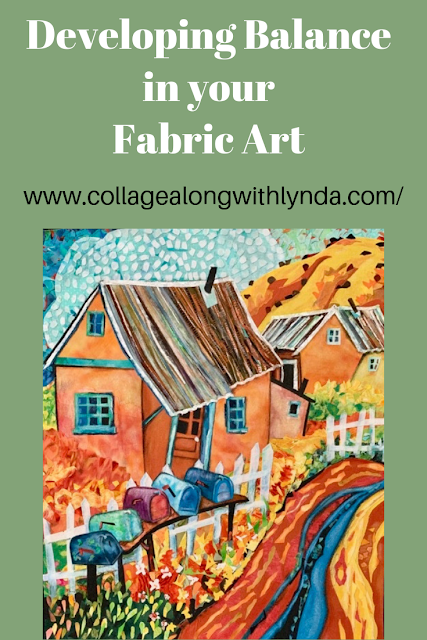 When I find a painting or photographic image that inspires me and impels me to create it in fabric, then I know I have something that I can teach with passion. So, that leads to the question that I'm most often asked, "What inspires me?" Since I'm also a writer of contemporary fiction, I'm often inspired by things that have a story element to them. Things that spark a fundamentally emotional cord within. Things that show me what could be. Things that cry out for embellishments. Things that invite me to lose myself in them. Literally anything can inspire if we're sensitive to inspiration, eager to learn, and not afraid to try something new. 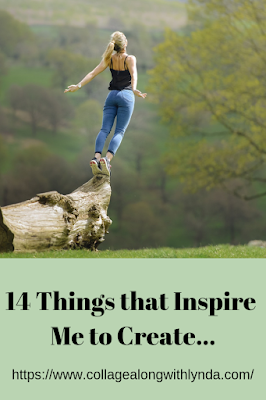 And if you're looking for an untapped source of inspiration, check out my new series. So, now it's your turn. WHAT INSPIRES YOU?